“But there is no doctor here,” the man repeated. The design of the samech is a closed circle. A circle represents infinity, because it has no beginning or end. In Kabbalah the samech represents the infinite power of the Ein Sof, G‑d’s infinite light. The samech also symbolizes an ambitious, enter­prising individual. The samech also resembles a wedding band. In a relationship, a husband and wife have a strong desire to be wholly bonded as well as an intermittent need to separate. Since a circle has no points of distinction, the many different aspects of marriage do not need to conflict with one another: they can be ultimately bound together within the same uninterrupted structure of the circle. The numerical value of the samech, the fifteenth letter of the alef-beis, is sixty. In the Priestly Blessing5 recited every morn­ing there are fifteen words and sixty letters. When the kohen blesses the people,6 he must put his two hands together. According to the Mishnah there are thirty bones in each hand, sixty when the hands are joined. What is unique about the Priestly Blessing? The results of such blessings are swift and without interruption, similar to the strength of a current of mighty water that no dam can stop. The Priestly Blessings embody the concept of the samech: infinite light and power. A halachah regarding kashrus is an example of samech’s strength. Suppose someone is cooking a big cholent7 full of meat and needs to prepare a bottle of milk for his or her baby. A drop of milk accidentally falls into the pot. Is the cholent now unkosher? The law states that if there is sixty times the amount of cholent to the one drop of milk, then the error is completely nullified. The ratio of this nullification is one to sixty, and is the origin of the term batel beshishim (“nullified by sixty”). It is interesting to note that the word ayin, which means “nothing,” reiterates this concept when the value of its letters are added: alef = 1, yud = 10, and nun = 50, equaling 61. One to sixty is like nothing. Other significant connections to sixty: King Solomon had sixty of his finest men surrounding his bed every night for protection. The Mishnah has sixty tractates. Sleep is one-sixtieth of death; a dream is one-sixtieth of prophecy; fire is one-sixtieth of hell; and honey constitutes one-sixtieth of the manna. 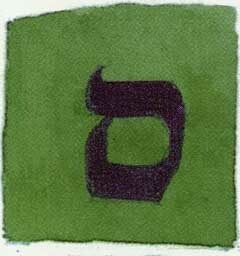 Being the fifteenth letter of the alef-beis, the samech shares an interesting connection to marriage through the number fifteen. The Talmud8 states: “There were never greater days of joy for the Jewish people than the fifteenth of Av.” On the fifteenth of the month of Av the single girls of Israel would go out into the field and dance in a circle (a samech) and sing, “Boys, pick up your eyes and look and find yourself a wife.” Since a man and woman joined in marriage represents the greatest oneness and therefore the greatest joy in the world, this joy can be attributed to the circle of the samech. The word samech means “to support,” as it states in the Shemoneh Esreh:14 “Someich noflim—You support those who fall.” It is not by chance that the samech follows the nun in the alef-beis. As mentioned earlier, the nun is one who has fallen, and as such, needs the samech to be supported or lifted up. On the other side of the nun is the mem, which also bolsters it. But the samech is greater than the mem. Every day we say in the morning blessings15 that G‑d is Someich noflim—He supports those who fall. We also say that He is Zokeif kefufim (with the mem appearing at the end of the phrase)—He straightens those who are bent. While the mem signifies the straightening of one who is bent, the samech can bear the weight of those who have entirely fallen. The first two letters of the word samech are סמ—samech-mem. Together they spell the word sam, which means a potion or medicine. This is not only relevant with regard to one’s physical health but also one’s spiritual health. The word samech סמך is an acronym for: salach סלח,to forgive; mechal מחל,to pardon; and kaper כפר, to atone. When one takes strides to forgive, pardon and atone, one achieves a great spiritual heal­ing. It is also said that the samech and the mem represent two distinct eras.16 The closed mem represents Gan Eden, Paradise (which is concealed from the human eye), the world of souls which currently exists in another dimension. The samech (which is greater than the mem) represents the era of Techiyas HaMeisim, the Resurrection of the Dead.17 This is the ultimate manifestation of Mashiach’s coming, when all the souls of the departed will return to bodily form and reside on earth for all time. In the World to Come, the ring of the samech becomes even greater than its original function of supporting the fallen. For then it will radiate the infinite, transcendent healing which will last for eternity. The mitzvah of “lulav and esrog” performed during the holiday of Sukkos consists of combining a date palm branch, myrtle twigs and willows into one entity called the lulav, and joining it with a citron (esrog) while making a series of prescribed movements. On a practical note, this means that if the Jewish people study Torah and observe mitzvos, G‑d will provide them with sustenance and livelihood (symbolized by the all-encompassing blessing of rain). Numbers 6:23. Also see Siddur Tehillat Hashem, p. 10, et al. For a Chassidic insight into this mitzvah, see Derech Mitzvosecha (of the Tzemach Tzedek), pp. 223-224. Kehot Publication Society, Brooklyn, NY, 1991. A hot stew of meat, potatoes and beans traditionally eaten on Shabbos day. Sefer HaMaamarim Meluket, vol. IV, p. 348. HaYom Yom, entry for 15 Av. The Alef-Beit, op cit., p. 228. The Amidah prayer, the focal point of the prayer service. Sefer HaArachim Chabad, Osios, letter samech, p. 238. While the mem represents Mashiach, the samech represents sovev kol almin, G‑d’s infinite light that will be revealed at the time of the Resurrection of the Dead. message explained I was reading this and seriously thinking over it. In my mail (a moment ago), I received a letter asking for donations to help elderly hungry widows in Israel. On the envelope, there is a elderly woman bent over digging in a dumpster. Inside the envelope, Isaiah 46:4 is in bold. It has in Hebrew a Jewish table blessing on the other side.